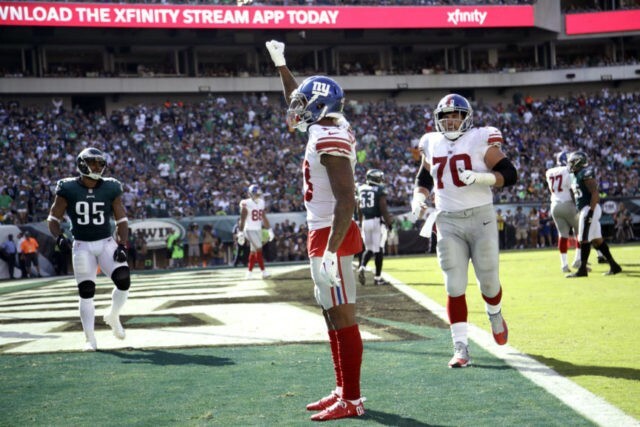 EAST RUTHERFORD, N.J. (AP) — New York Giants receiver Odell Beckham Jr. had little regret about the dog-like celebration that angered the team, and claims NFL rules about post-score revelry are confusing. Beckham said Wednesday he met with unhappy co-owner John Mara to discuss his vulgar celebration in which he got down on all fours and pretended to urinate like a dog after catching a fourth-quarter touchdown pass in a loss to the Eagles. The three-time Pro Bowl receiver would not reveal what was said. His only regret was that the officials called a 15-yard unsportsmanlike conduct penalty against him. Beckham refused to discuss his celebration, its meaning or whether it was spontaneous or planned. He added he will have a better one in the future. Coach Ben McAdoo said such actions are a poor reflection on him, the program and on the organization. He said the team has a plan if Beckham crosses the line again.